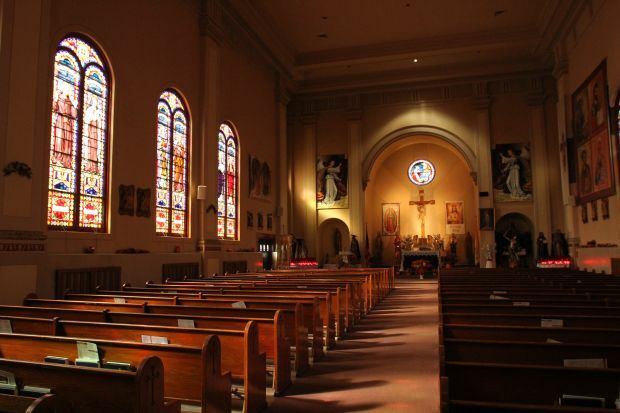 NEW YORK (CNS) — In a long-awaited but nonetheless stunning announcement, the Archdiocese of New York said Nov. 2 it would merge 112 of its 368 parishes into 55, effectively shuttering at least 31 churches by Aug. 1, 2015. Cardinal Timothy M. Dolan of New York said the painful reorganization is a necessary adjustment to historic parish infrastructure that will strengthen the Catholic Church in the archdiocese. “The parish is the people and the people have to be cared for. What’s most important is the faith continues, the Eucharist continues and the sacraments continue,” he said. The cardinal spoke to Catholic News Service and Catholic New York together after the mergers were announced. He said All Souls’ Day was a fitting time to break the news because the feast and the decisions are not about dying, but rising. The cardinal said the math shows an awkward, lopsided distribution of parishes that is inconsistent with Catholic population, especially in Manhattan. He said 25 percent of the parishes of the archdiocese are located in that borough, yet only 12 percent of the Catholic population is there. In Manhattan, 28 parishes will merge to form 13 and nine sites will no longer hold weekly Mass, although they may be used on special occasions. The mergers are the culmination of a five-year pastoral planning process known as Making All Things New, which sought input from 368 parishes clustered into 75 groups, as well as a 40-person advisory committee, the archdiocesan priests’ council and archdiocesan staff. “We have to turn from being shepherds to being fishermen and (the mergers) will free us up to do that. We will have better utilization of priests, trained lay ministers, religious women and men who are involved in leadership who aren’t going to have to spend all their time propping up places and are going to be better used at, granted, fewer, but much more vigorous and solid parishes,” he explained. Auxiliary Bishop John J. O’Hara, director of the Making All Things New process, said the archdiocese would provide guidance, direction and support to pastors to help them shepherd their people in the mergers. He said the transition to the new parishes will likely be marked by prayer services, liturgical expressions and the procession of items from the old church to the shared site. While he did not anticipate another wave of mergers, he said there are parishes whose input is still being considered. Addressing the larger picture, he said, “Everybody with an ounce of common sense in the United States is in strategic pastoral planning mode,” which involves mergers in some areas and building new churches and schools in others. PREVIOUS: Woman’s suicide called tragedy, symbol of ‘culture of death’ in U.S.